Shorty's Bear Safety Service, Inc. was opened in 1960 by James H. Bryant (Shorty) and Eugenia Bryant at the current location of 2801 S. Osage in Amarillo, Texas. Originally Shorty’s was a front end and suspension specialty shop when it opened in 1960. Shorty passed away August 20, 1965 at which time his wife Eugenia leased out the building and business until December 1980. Brakes and suspension are possibly the most important safety issues on a vehicle. Brake pads will last 35,000 to 95,000 miles depending on the driving habits and the type of brake pads. New pads start at 10 to 12 millimeters thick. and should be replaced at about 2 to 3 millimeters. What Are The Benefits Of Having A Wheel Alignment Done To Your Vehicle? 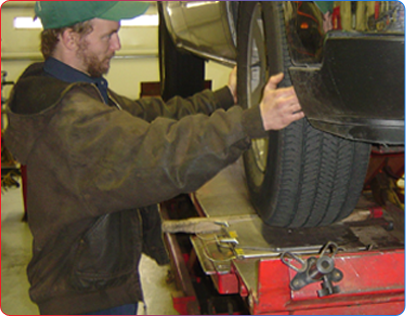 A wheel alignment adjusts a variety of suspension components to help the vehicle drive straight and reduce tire wear. By ‘squaring’ the wheels and suspension, tires have less friction and ride smoother, making it easier and more pleasant to drive. A slight increase in gas mileage may also be noticed. Ask family and friends for their recommendations. Ask about their credentials. Are they members of BBB? If so, what is their rating with BBB? Do they belong to any other trade association such as the ASA (Automotive Service Association)? Ask about the repair centers warranty for parts and labor. Most warranties are 12 months or 10000 miles. Ask if they provide written estimates when requested and do they call to inform you of any changes to the estimates. Ask how long they have been in business, as well as how long they have been at their current location. The crew at Shorty’s Bear got me in the same day as I called and performed maintenance that my Ford F350 required. I was traveling through Amarillo and was losing power in the truck. They fixed me right up and got me back on the road in a timely manner. I definitely recommend them.